In this episode of the You're Making Me Podcast we'll cover ways to stay excited about your goals by Igniting a burning belief in yourself. If you've read my book Diamonds and Silver, you might recognize it as the first lesson our hero learns. This week's Top X of a Topic is on the same topic. 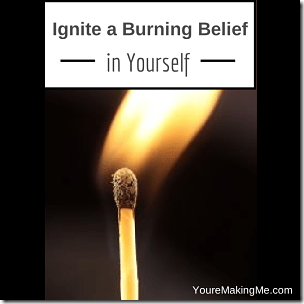 X=3 this week, which means I'll count down the three top ways to ignite a burning belief in yourself. Other than that, I've got some news to share, and a little bit of gossip. The balloon technique and how it applies to motivation, and why you should NEVER visualize RED balloons. I'll give you an example of an “Fake it 'till you make it” horror story. I'll also tell you why you should still fake it anyway. The current XMind package – You get the Visual Productivity eBook, the tutorial videos, and the companion workbook free if you get it via my link. John Travolta Strutting [YouTube] – An example of how to walk with swagger (to Staying Alive by the Bee Gees). It still works. Diamonds and Silver [Amazon] – A link to my book. Ignite a Burning Belief in yourself is the first lesson from the book.